It's been really sunny lately. Got no money for a fancy pair of shades? Canadian Tire has a $2 Sunglasses Bargain Bin. 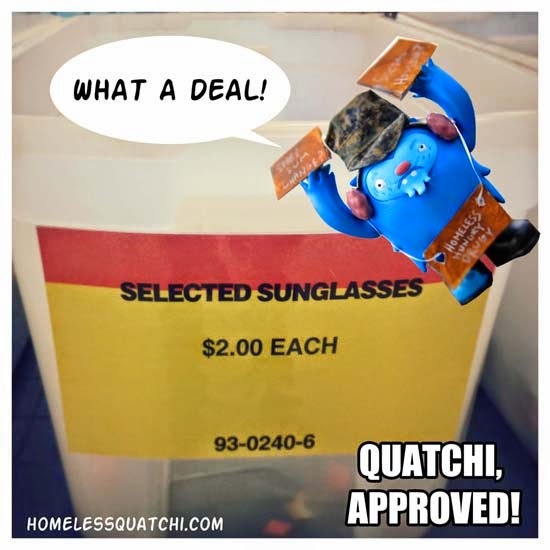 Even Homeless Quatchi can afford that! Go and get it while the sun still shines, Vancouver! Why is this awesome? Because $2 is cheaper than a translink transit ticket! Other Canadian Tire Stores may have the same deal. So stop by the location in your hood! COOKIES BY GEORGE - BEST COOKIES IN CANADA!